There’s no better way to enjoy Northeast Florida’s outdoors nature and wildlife than a guided kayak fishing trip in our rich fishing estuaries. Whether you want to catch Redfish, Trout, and Flounder in Jacksonville’s inshore creeks and saltwater marshes, fish the beaches for Tarpon, cast a line for Bull Redfish at the jetties during their spawning season, or target big game fish offshore on a mothership expedition, KayakMike’s Charters has the package for you. Captain Mike Kogan, a.k.a. “KayakMike”, is a U.S. Coast Guard licensed charter captain and kayak fishing guide specializing in both inshore and offshore kayak fishing trips. 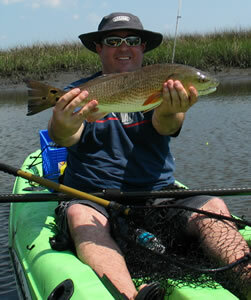 Whether you are an experienced or novice angler or paddler, KayakMike can guide you on a memorable kayak fishing trip. At KayakMike’s we provide state-of-the-art equipment including fishing kayaks, all the fishing tackle you need, and the experience to put you on the fish and have a great time enjoying our inshore and offshore waters. All you need to bring is yourself, clothes appropriate for the season, and a desire to have fun kayak fishing!